Last week, leaders from Mexico, Canada, and the United States attended the North American Leaders’ Summit. 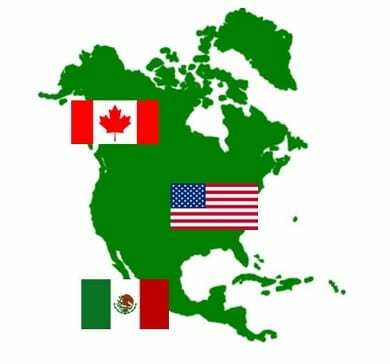 There, President Barack Obama, Prime Minister Justin Trudeau, and Mexican President Enrique Pena Nieto agreed on a new renewable energy target for the whole of North America. Together, the three countries will work to ensure that North America generates no less than 50% of its electrical power from renewable sources by 2025. The goal has been praised among supporters of clean power, but certain challenges exist that may make the goal unobtainable. In the United States, wind and solar energy are set to be the cornerstones of the new environmental goal. The country intends to rely heavily on the booming wind and solar markets, which have been growing aggressively in recent years. Wind and solar farms are becoming less expensive and more efficient. As such, these forms of renewable energy are quickly become the favored form of electrical power in the country. Despite the growing popularity of solar and wind, however, these forms of energy only contributed approximately 5% of all electrical generation in the United States in 2015. Solar and wind may not be able to ensure that the U.S. can reach its energy goals by 2025. A broader focus may be needed to help the U.S. reach its new ambitious goal. The country may have to focus more heavily on nuclear power, as well as other forms of renewable energy, to meet its goal. Nuclear currently accounts for 20% of energy production in the U.S. and has long been a reliant source for electrical power. Despite the viability of nuclear power, nuclear facilities throughout the country have been losing support, with utilities planning to close some of these facilities down. Even with a focus on nuclear, the U.S. may have to turn to other forms of energy to meet its environmental goals. Various forms of renewable energy have established a foothold in the United States in recent years. Hydropower remains a very favorable source for carbon-free electricity, and both wind and solar show significant promise. Hydrogen fuel is also becoming a more attractive option, especially in the residential space. In other countries, fuel cells have shown that they can provide homes with both heat and electrical power in an environmentally friendly manner. These energy systems may play a role in the country’s renewable energy goal in the coming years.